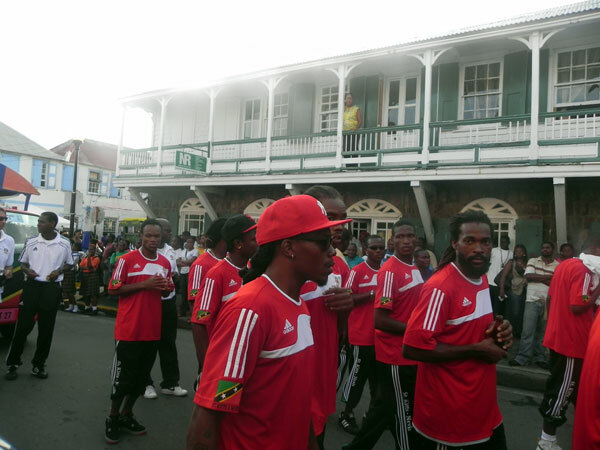 Basseterre, St. Kitts-As the momentum builds for next week’s World Cup Qualifier game between St. Kitts & Nevis and Canada, the National Team took to the streets of Basseterre on Friday, for a promotional motorcade. According to organizers of the event, the idea behind the motorcade was not to celebrate a victory, but to sensitize the public about the upcoming important encounter, that would see the home team in a tough battle to secure a place in the next round of matches, on the long journey to qualify for the 2014 FIFA World Cup, to be staged in Brazil. It was also an opportunity to introduce the players to the public, so that Kittitians and Nevisians could be more familiar with the talented players who are carrying the mantle to represent the federation at this high level of international football. 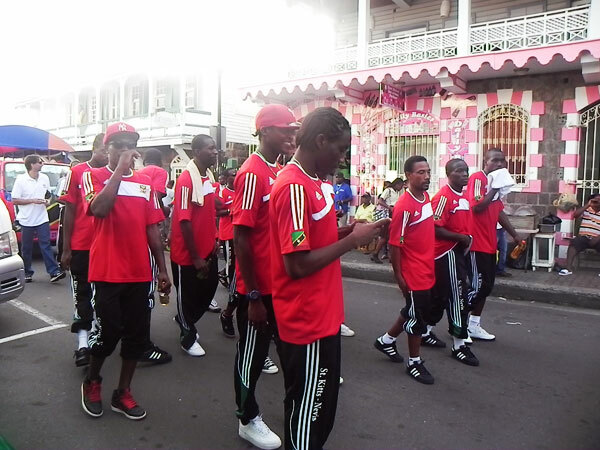 The Football Association spokesperson also indicated that as nationals and residents, we all have a responsibility to turn out in large numbers to support the honour of St. Kitts & Nevis and the players, because it is this type of public support that would help to energize the players, leading to better performances and therefore increasing the possibilities of victory over the Canadians, who in the past have made it all the way to the FIFA World Cup Finals. 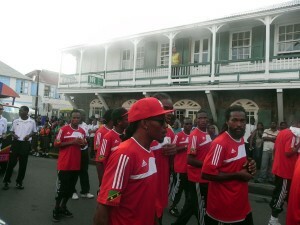 The official stated that St. Kitts and Nevis too, can make it to the “big leagues” (meaning the World Cup), but the road would be much easier if every Kittitian and Nevisian understands that they too have a role to play, even if it is only to attend the match, wave a flag, or shout their support for the team. 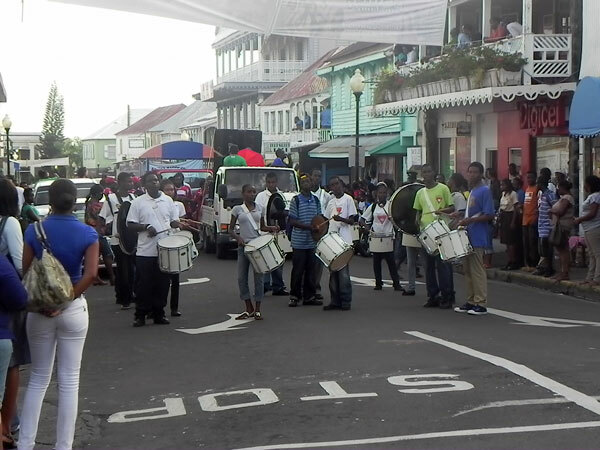 Friday’s motorcade drew a large crowd of curious onlookers, especially as the procession made its way through the city centre of Basseterre, with fans hugging the players, shaking their hands and expressing words of solidarity for their effort to defeat Canada. 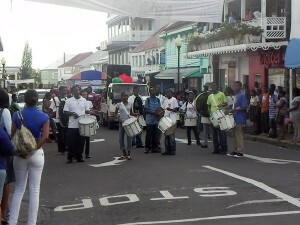 The process began at the Kim Collins High Way, continuing through the Paul Southwell Industrial Park, Bay Road, Fort Street and concluding on Lozack Road, in front of the headquarters of the National Football Association, where a “Block Party” was held with entertainment being provided by the popular Nu Vybes Band International. Meanwhile, tickets for the Canada- St. Kitts & Nevis game are now on sale at various locations, including the Football House (headquarters), on Lozack Road and at the St. Kitts Marriott in Frigate Bay. The match is scheduled for Friday 11th November, at 8:00pm, at Warner Park.